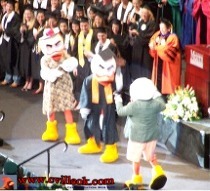 Sabastian The Ibis (UM's mascot) made his parent's proud at Emily's commencement on the Coral Gables campus May 11th. 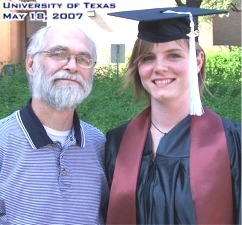 Emily Wright (CHS 2003) posed with Dad (Ted Wright) after receiving her BS Degree (with a double major in Marine Sciences and Biology, and minor in Chemistry). 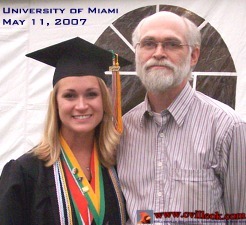 Samantha Wright (CHS 2000) posed with Dad (Ted Wright) after commencement for her BA Degree in Art (Studio Art major). 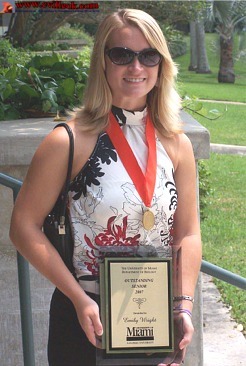 Emily was honored by the University of Miami Biology Department as the "Outstanding Senior". Emily's honors thesis was titled: Diversity and Temporal Changes in Marine Benthic Macrofauna Assemblages of the Bahamas. 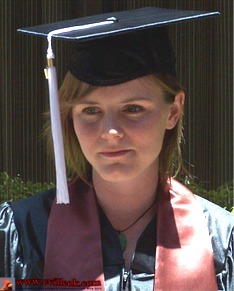 Samatha posed outside some of her University of Texas art classrooms (right). 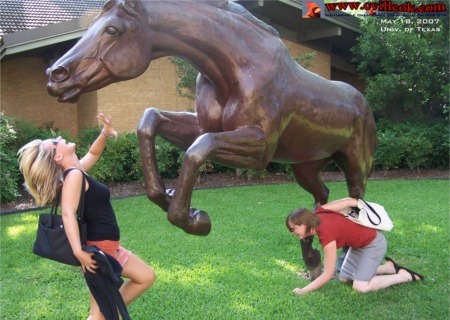 Emily & Samantha "horse around" with a statue across the street from the University of Texas (Darrell Royal) football stadium. 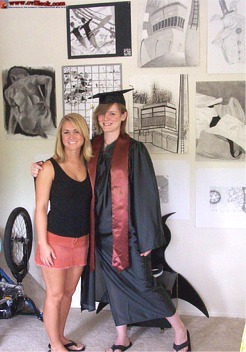 Emily & Samantha pose with some of Samantha's art work she had on display in her Austin apartment. University of Miami President Donna Shalala addresses the graduates before the keynote speaker, Fareed Zakaria (of Newsweek and ABC News). 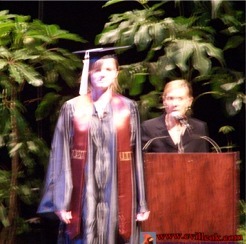 Samantha crossing the stage at the UT Fine Arts Commencement Ceremony. 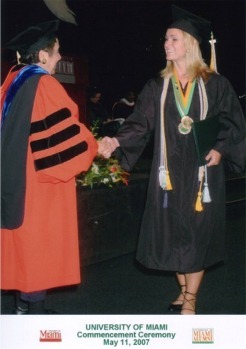 Emily shook hands with UM President Donna Shalala as she crossed the stage during commencement. 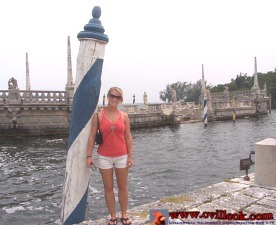 After graduation in Florida we toured the Vizcaya Museum & Gardens in Miami. This was the former winter estate of James Deering who was the vice president of International Harvester. 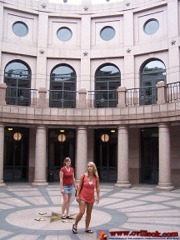 After graduation in Texas we toured the Texas State Capitol in Austin. 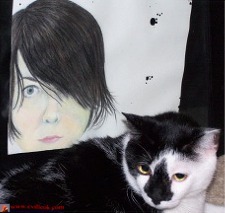 Samantha's cat Rocky posed with some of her art work. 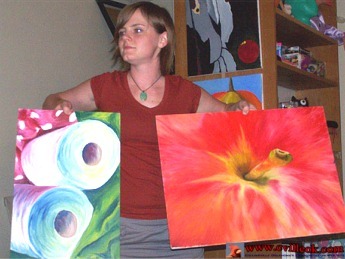 Samantha sold two of her paintings at an art open house. Note: It helps to be a proud Dad for an OU graduate to tolerate being in large gatherings of folks singing the Miami fight song or "The Eyes of Texas Are Upon You." Another highlight of my trip to Austin was finally getting to view (in person) the large multi-panel mural in the Austin Airport painted by my cousin Tommy Evans. 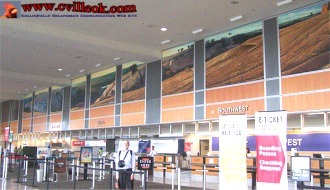 The mural hangs over the Southwest Airlines ticket counter. 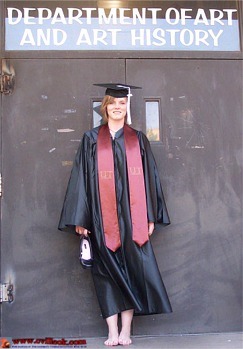 Tommy is the son of Marvin Evans (CHS 1936).